The Latest Argument Against "TV Turn Off Week"
Breaking news: TV makes you smarter. The New York Times, so it must be true. The Smoking Gun is blowing the whistle again- and this time, an American Idol finalist is being exposed. Harold "Bo" Bice, 29, was busted in June 2001 by Huntsville, Alabama cops and hit with felony cocaine posession. He was arrested again in 2003 for marijuana possession, public intoxication, and possession of drug paraphernalia. Most of the charges, including the coke rap, were eventually dismissed. Maybe he's the one scoring for Paula? Star power still means something. On FX's The Shield, the addition of Glenn Close has given the show a big ratings boost, one year after the critically acclaimed show took a serious ratings hit. Since Close joined the force, The Shield has regained the impressive numbers that it saw during its first two seasons. And it has to be because of Close's presence, because this season has flat-out sucked (this, from a huge Shield fan such as myself). 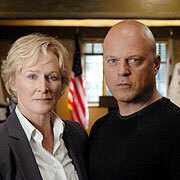 The Shield airs Tuesdays at 10pm ET on FX. BBC Worldwide sis teaming up with HBO to produce the new comedy series Extras from Ricky Gervais and Stephen Merchant, the duo behind the cult BBC comedy The Office. Through the deal, HBO will air Extras in the U.S., and BBC2 will air it in the UK. It has not been determined who gets to air Extras first. This is great news for fans of the original Office, as Amercans will be able to see the new show much sooner than anticipated. Mary Hart, Matron of Honor? Entertainment Tonight has the gross-out exclusive of May sweeps: they've won the rights to the wedding of Mary Kay Letourneau and her former sixth-grade pupil Vili Fualaau, the father of her two youngest children. ET and its sister show, The Insider, planned to begin offering the first in a series of interviews with the couple Thursday. They should be very proud of themselves. I'm surprised LeTourneau is even still interested in Fualaau, who's now the ripe old age of 22. Isn't he a little long in the tooth for her? Katie: "It's Not About Me!" NBC Today star Katie Couric disagrees with critics who say the show has become all Katie, all the time. Couric also insists she played no role in the shitcanning of producer Tom Touchet, and thinks the show needs toi get back to its hard news roots. Her $15-million-a-year contract expires next May. Comedy Central Goes On The D.L. Comedy Central is giving its Daily Show slot to D.L. Hughley- on weekends, anywaytext . The cable network has picked up the actor-comedian's half-hour talk show pilot, tentatively titled Weekends at the D.L. It will run at 11 p.m. Friday-Sunday for 13 weeks in mid to late summer. Episode 4 x 17: "A Clean Conscience"
OK, sure, Jack's dying. But what a momentum killer this ep was. No Sloane Cloane. No Rambaldi. And certainly no wigs. When George buys a handgun, who almost gets shot? So, some group wants Americans to turn off their TV for an entire week. Sounds like they had good intentions. Pay more attention to your family and friends, read a little more, talk a little more. 'Course, if you've got a family like mine, that's the LAST friggin' thing you need!! Miss the opening round of the NBA playoffs? But this is the ONE time of the year when the NBA is even remotely relevant. Miss a week of Major League Baseball in April? When every team still has a realistic shot at keeping their world championship dreams alive? Well, except the Devil Rays. Miss a week of Monday Night Raw? (ok, so it's technically sports entertainment). Whatever. Show me another program with hotter chicks than Vince McMahon has parading around in various stages of undress. Plus, script or not, some of those folks perform some of the most athletic stuff on the tube anywhere. Miss a PGA playoff between Vijay Singh and John Daly... two golfers on the opposite ends of the game discipline spectrum? There was the distinct possibility of Singh calling Daly a slob, and Daly asking Singh if he was late for his night job at 7-11. Plus you never would have seen Daly's son following him around the course with a traffic cone stuck on his head. Do you get the feeling that the people who want you to turn your TV off for a week are the same folks that were always picked last for dodgeball in elementary school gym class?